This isn’t the first time I’ve been to Mount Haruna (known as Mount Akina in Initial D), but it is the first time I’ve gone at night. To my surprise, other than a Nissan R-34 GT-R and a Mitsubishi Evo who left as I showed up, I had the entire mountain all to myself until the following morning. This is what it was like. There are five routes up and down Haruna. I’ve driven three of them, the ones running South. Two run North. 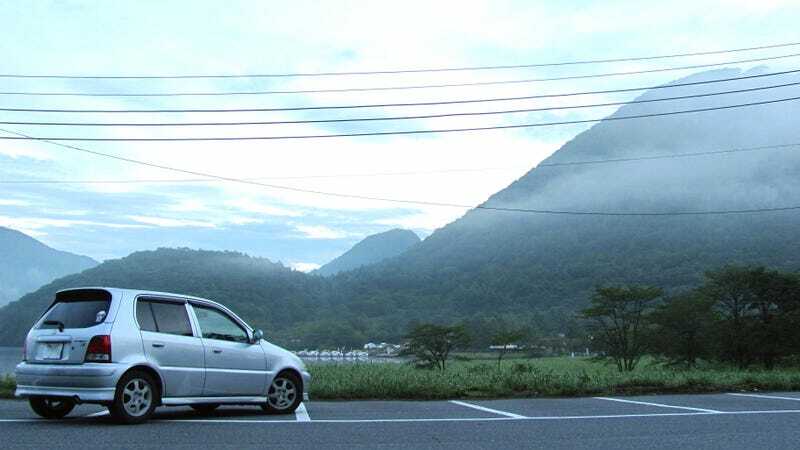 The most famous from an Initial D perspective is the route running Northeast, the Panorama Highway, but the other routes have plenty of hairpin turns and opportunities for fun mountain drives. I drove up at around midnight, using GPS to plot me a course up to the top of the Haruna along Highway 26 and back down again along Highway 33. I also took some time to run along Highway 126. All are pretty much within Takasaki city limits, with some exceptions. Coming from central Takasaki you first start noticing that you’re heading up the mountain when your ears pop. Haruna comes upon you suddenly, visually speaking, but you’ve actually been climbing for a good half hour in altitude without even realising it. And then you end up coming suddenly upon a major gradient shift and you find yourself clawing up a road which has become both steeper and narrower. Not to mention very curvy and very, very dark. Reflectors are sparse. Signs aren’t as reflective as you would assume they should be. On the way up 26, mirrors are nonexistent, and with the sharpest of hairpin turns, and only one car width of road to travel... Well, lord help you if someone were to come barrelling down the road the opposite direction. Even at the posted 40km/h speed limit, a collision would be catastrophic. If you’re lucky, you might smash into the mountain wall. If you’re not so lucky, you could crash into the guard rail, and if you are very unlucky, you could crash through it and find yourself rolling down the mountain to almost certain death. As I began to notice the very start of nautical twilight and went up over a hill and around a curve going well under the speed limit, I suddenly drove straight into fog so thick, I was pretty sure I was going to crash into the guard rail and fly off the mountain. I didn’t have time to think much else beyond braking with care and control. My life didn’t flash before my eyes. I wasn’t even frightened. I was surprisingly calm as I slowed down and turned towards where I thought the mountain might be, thinking that would be a much better accident than the alternative. The fog didn’t lift, but it did thin out as dawn continued to creep up around me. In those pivotal milliseconds where I was effectively blinded by a blanket of pure white, I had turned the right amount at the right time and kept myself dead center of the narrow road. I’m not arrogant enough to think that was even a significant portion skill, it was a vast majority luck combined with the fact that I didn’t panic. Not panicking is a skill, yes, but the decision I made in turning was pure guesswork and not guesswork done in ideal conditions. Perfectly legal and relatively safe driving on these roads is dangerous. Racing on them, as we all know people do, and which Initial D glamourised, is incredibly, profoundly, demonstrably stupid. There’s no reason why you can’t drive at night on these roads and enjoy it, but be aware, be a critical thinker, and be safe. As I made it up to Lake Haruna, the volcanic lake under the peak, dawn finally broke well enough to see everything, and I parked at a few different locations to enjoy the sunrise. I was no longer alone, there were four other people scattered around the lake doing the same, but they were coupled off. One pair had come by motorcycle, the other pair had come by car. The drive down 33 was by far much more fun. Not only was it far less frightening because the sun was fully up by the time I headed down it, but the rode was significantly wider. This is where I saw the R-34 GT-R and the Evo pull out. It wouldn’t surprise me to believe they had done some sort of time attack up 33 as I was getting ready to head down. As I got further down the mountain I began to see the marks which told the tale. Another reason I really enjoyed going down 33 was because to stay at the speed limit in the GA3, I didn’t even need to accelerate. And I rarely needed to use much braking because the engine braking was working well on its own. It was a quick and fun slalom down 33 with no one else on the road, and it was all perfectly legal and safe. Images via Google Maps, Wikimedia Creative Commons, and Kat Callahan/Jalopnik.